Storm upon storm, and inches of rain that won’t stop for days are probably the most interior project motivators that might exist! I mean what else are you going to do when the water starts rising and you expect Noah to pull up in his ark any moment? You get stir crazy and decide to paint and redecorate! Well, at least that’s what I do. Put a paint brush in my hand and all the world is sunshine and rainbows once again. My rainy day project was working on some Coastal Kitchen Dining Area Summer Updates. This area has been gnawing at me for over a year. I know many of you will say I should have left it as is but this dining area of my kitchen and staircase is the only place in the house where black is prominent. In single photos it all looks fine but when you back up and see the downstairs as a whole, this little area was feeling way to heavy in comparison. So I asked a question on my Instagram page if I should paint the railings white and wow, people had opinions! I decided to go for it and just paint it. I mean it’s just paint. I’ll probably change it next year anyhow. 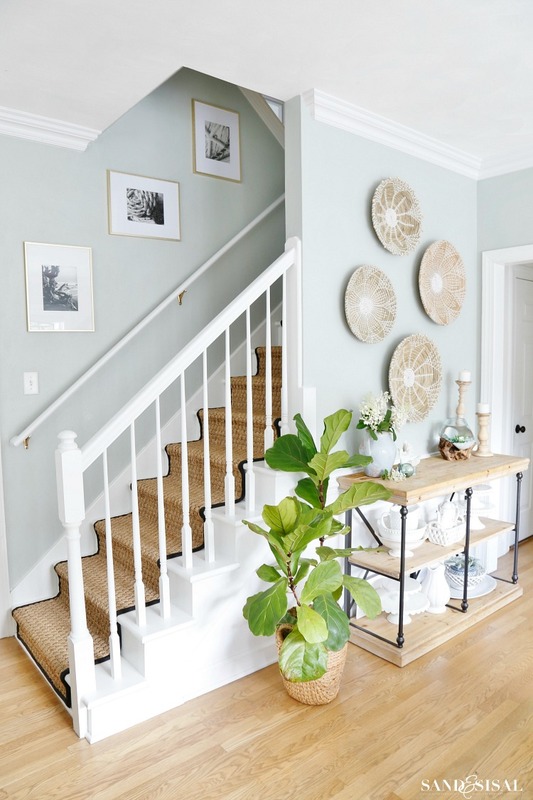 Here is an older photo from our Painted Staircase with Seagrass Runner Makeover. (Click that link to learn how to install a seagrass runner). Ta-da! 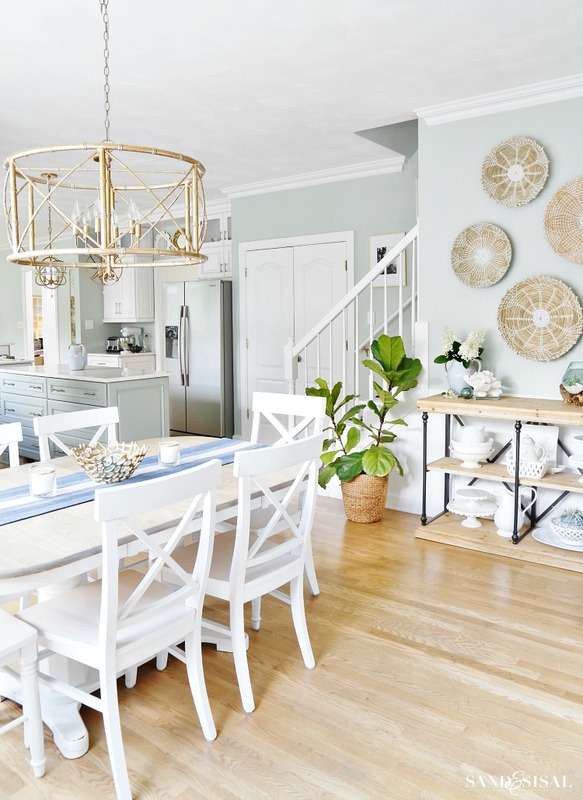 Welcome to a lighter and brighter coastal kitchen dining area! I didn’t eliminate all the black accents, instead just toned them down. These beautiful boho baskets were found at HomeGoods and I went back twice to buy more. One little nail in the middle holds them up. 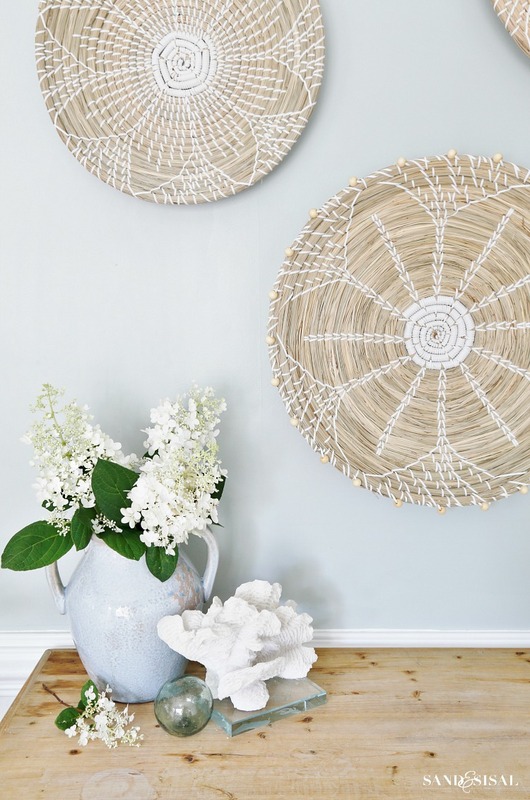 The boho basket wall decor trend is speaking to me right now. 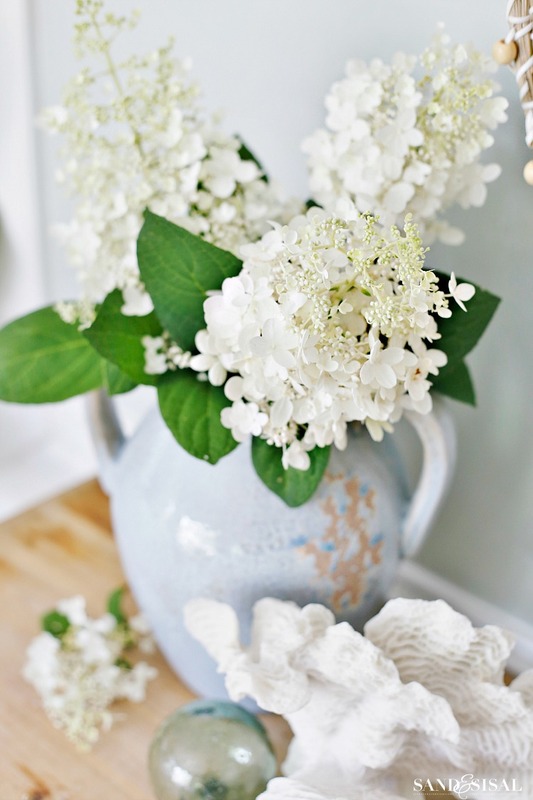 My white panicle hydrangeas decided to bloom and thrive during all these storms so I ventured outside and gathered several of the beautiful fluffy blossoms. I found this awesome wood stump and hand blown glass bowl at a local imports store. It could be a terrarium but my kiddos quickly claimed it as a fish bowl for “Marcello”, our new Beta fish. Isn’t is fabulous? The glass is hand blown and then while still hot they lay it upon the stumps to then burn, form and cool around the nooks and crevases of the wood. Each piece is unique! The biggest and easiest change was priming and painting the railings white. I washed the black stained railings really well, then lightly rubbed them with a fine grit sand paper to scuff the shine up a tad. Next I used my all time favorite and most trusted primer of all time. After a coat of primer, I gave the railings two coats of semi-gloss Extra White by SW. That is the white I use for all the trim in my house. Things feel more balanced now in our home. Who knew a week and a half of rain could pull out a desire to recreate and renew! 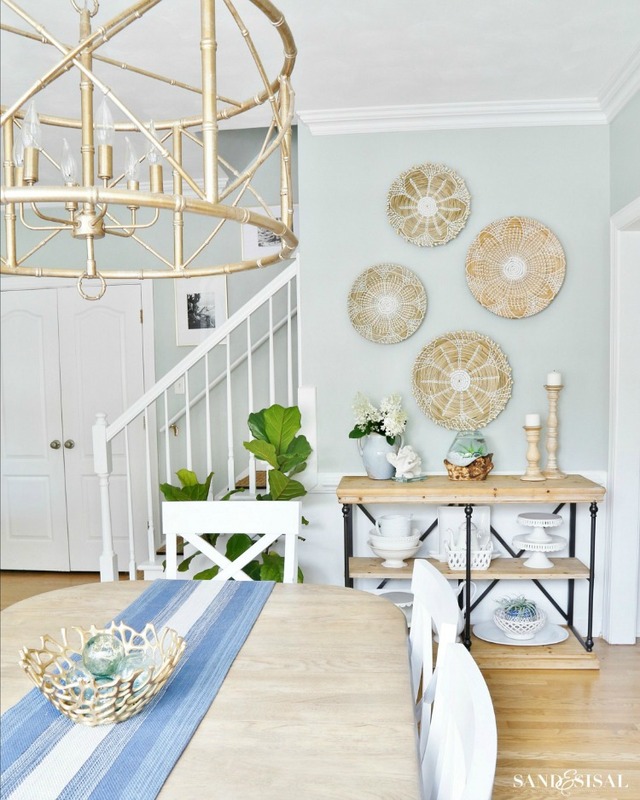 I hope you like our new coastal kitchen dining area summer updates! So pretty. 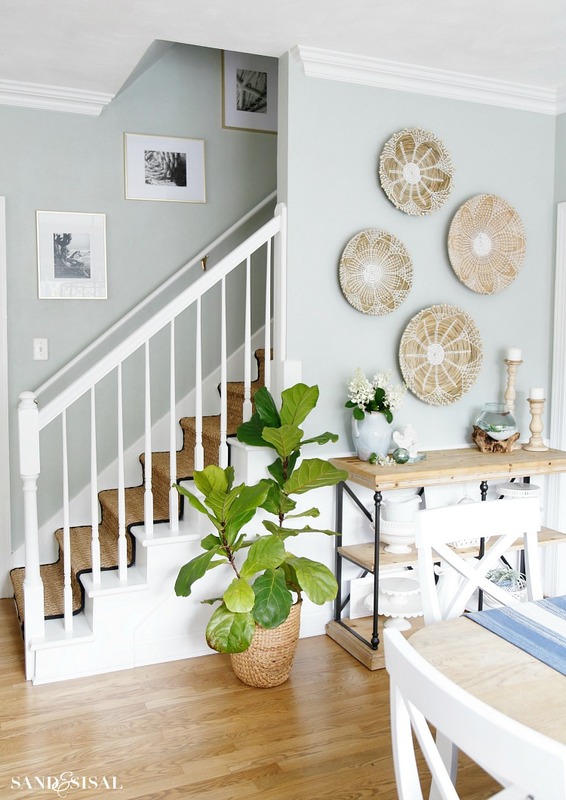 I love the natural wood tones and the use of baskets to carry the color across the wall. Beautiful room. Thank you Marty! I thought the light baskets helped carry the color throughout too! (You have great taste! ) heehee! Love the change – and where did you find the shelf table? Great find of the baskets at Homegoods too! The console table is from Kirklands. I bought it a few years ago but I think they still carry it. I used to use the table in my entryway but moved it to the kitchen so I could have more storage for platters and such. Hi Madaline! The wall color is Comfort Gray by SW.
What store did you get the awesome bowl and stump from for Marcello? Beautiful!! So light and airy. I love your style! Kim, I love the change! The white railing makes the space seem so much brighter. That fish bowl is amazing too. 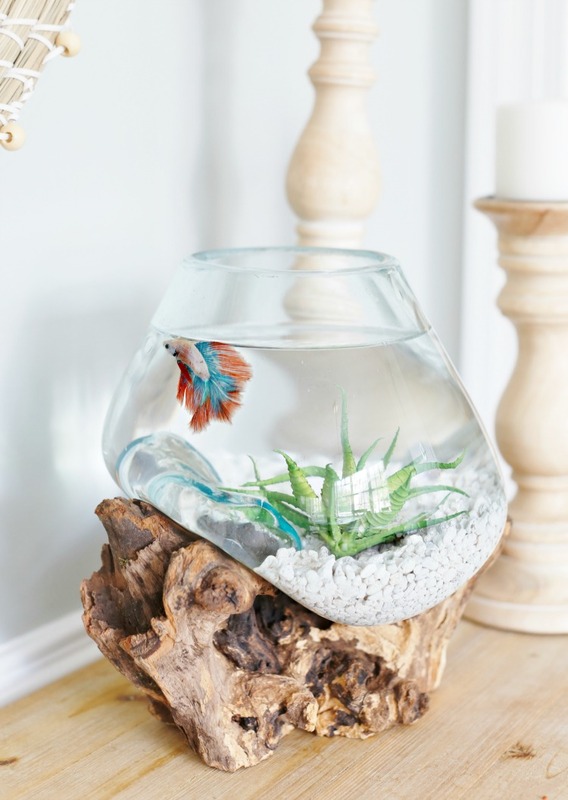 I can think of a ton of things to do with it but using it as a fish bowl might be the best! I guess I’ll need to go back and buy another one! They would make great gifts too! The bowls were only $23 each. Not too bad at all for handblown glass. Thanks so much for stopping by! I appreciate it! Kim I love the neutral tones…..so so coastal and I really love the mats on the wall with the design in them. Thank you Shirley! The minute I saw them I knew I needed to grab them up! Love every bit of it! The baskets are awesome, and that fishbowl is to die for. Now I have to see if I can find one up here in Ontario somewhere. 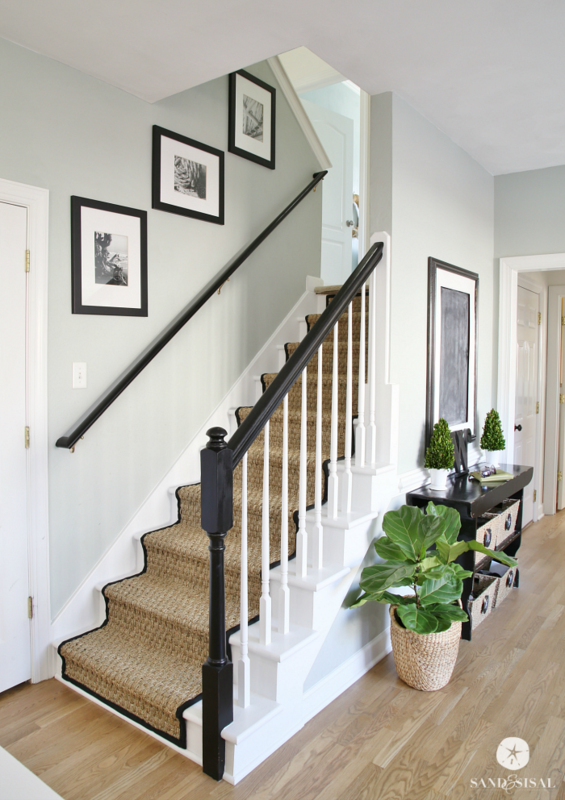 The little bit of black on the console, and the stair runner is the perfect amount. I love your blog/home, and enjoy following along as you create! Cheers! Absolutely love your new dining room area! Love the SW Comfort Gray – just wondered if you lightened it at all? We’ve had the kitchen in Comfort Gray for about 6 years now. I love the color. These photos do look a bit lighter than reality I noticed. That is due to my photo editing. But anything you see from my kitchen from past posts (search “coastal kitchen” in the search bar) is all Comfort Gray so those might give you a better idea of the color. Our familyroom is Sea Salt which is simply one shade lighter than Comfort Gray. So if you are looking for something lighter, then I’d recommend Sea Salt. Hope that clairifies things a bit! I love the natural earthy light open airy feel you created! The color for the walls couldn’t be more perfect. Well done! So pretty! Where did you move that black piece to? (Console table? Shelves? Can’t tell…) Or did you paint that as well? I like the lighter look! Thank you so much Sheila! I actually moved that black sheving unit/console into the closet across from our interior garage door (just to the right of the photo). We use it for all the kids’ shoes and such. 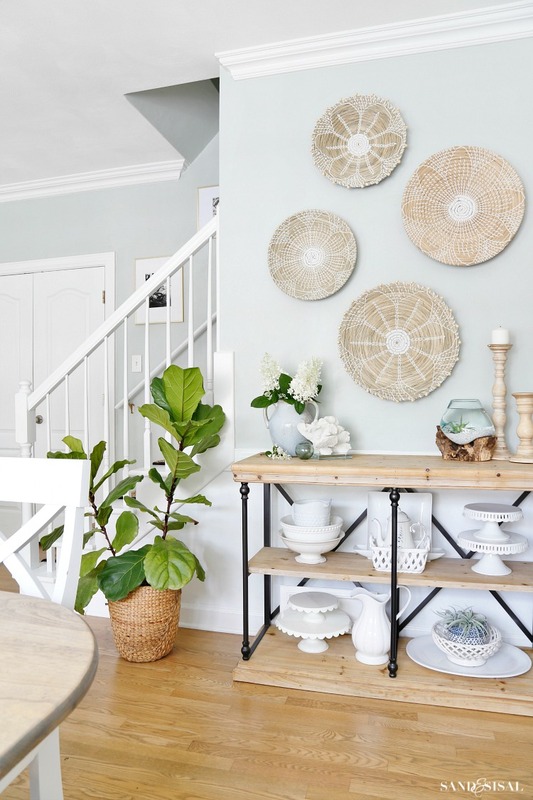 Are the boho wall baskets 2 different sizes? I think so but hard to tell from the photo. I love the look. I want to copy it for my dining room. Hi Tania! Yes, they come in 2 sizes 14″ & 20″. Thanks! Where did you get that wicker side table? Your colors a beautiful! I’m inspired! Hi Alli! Thank you so much! I’m glad you are inspired! I’m not sure which side table you are referring to. Do you mean the woven abaca round side table in the livingroom? The round can be found at Wayfair. The wood and iron console table in the kitchen eating area is from Kirklands. Hope that helps! Hey Kim!Im so in love with your kitchen and i really love the baskets on the wall..I’m trying to do the same in my kitchen but i need more baskets so where did u find them? Beautiful style! Can you please let me know where you got your kitchen table? thank you! enjoy your day! Thank you so much! My table was bought 25 years ago at a local furniture store. It was quite yellow/orangey in color and I refinished it several years ago to the weathered oak finish. Wish I could help you out more! I wouldn’t love to see pics of your family/living room! Wow, looking great, Kim. Love your decor. It’s so modern.